Today Zvenigorod is mostly associated with the name of the Russian satirist and playwright Anton Chekhov. After graduating from the medical faculty of Moscow University, the young doctor and writer worked in Zvenigorod. According to the local tour guides, Chekhov gradually became friends with his neighbours – and they began to invite him to drink tea with raspberry jam, and often for stronger drinks as well. This group spent great times at a table under a linden tree in front of Chekhov’s house. With every passing day, the number of those people wanting to join in the merriment increased and the celebrations grew louder, and so it was every evening until the early hours of the morning. This bothered respectable cottagers, and they wrote a complaint to the police about the “rowdy” Chekhov. He was fined. The house on the street called Malinovy Ovrag (Raspberry Ravine), where Chekhov lived, is now a museum. Moskovskaya Street – is the main street of the city, with shops, cafes and several sightseeing attractions. Let us start with the main church of the city, the Church of the Ascension (2a Moskovskaya Street). In the 16th century, there was a wooden church with the same name located here. Later in its place, they built a stone church. In 1941, the church was destroyed. Documentary descriptions and drawings of the church were not preserved, and so they were not able to restore it to its original appearance. Near the church, there is a small park. After that – there are historical buildings and low-rise 19th century buildings. Building No. 18 is home to the Museum of Russian Desserts. Here not only can you listen to a lecture about the traditions of Russian tea, but treat yourself to some Russian desserts with tea. After that, you should go to building No. 35. This is the Alexander Nevsky Church, built during the years 1898-1902 by a friend of Chekhov, the architect Leo Shapovalov. The sightseeing attractions of Moskovskaya Street end at this point. If you are still hungry after the Museum of Russian Desserts, or you want something not so sweet, then along the whole street, there are cafes, where you can have lunch or dinner. Then we go on to the western part of the city, the Gorodok Street. Here we find a historical place – an ancient town, where in the 12th century the foundations of the Kremlin (fortress) were laid, from which remnants of embankments with heights of 2 to 8 meters have survived to this day. In the central part of the town, in 1400, Prince Yuri Dolgoruky built the white stone Cathedral of the Assumption. The interior walls of the cathedral are painted with frescoes of the 15th century, which were made with the brush of the legendary Russian iconographer Andrey Rublev. 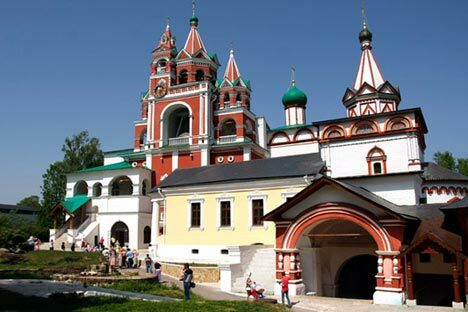 Finally, the main sightseeing attraction of Zvenigorod – the Savvino-Storozhevsky Monastery, is located 1.5 km from the city on the high bank of the Moskva River. Founded in the late 14th century by Savva Storozhevsky, a disciple of Sergey Radonezhsky, the monastery is well preserved and includes the Cathedral of the Nativity, a refectory, which is adjacent to the Church of the Transfiguration, built in 1695 by Princess Sophia. The red and white Trinity Church (1652) is located next to the Tsaritsyno Chambers and a belfry. Right next-door is a brethren building with cells of the monks. The monastery had seven towers, of which six have survived to this day. According to the legend, during the War of 1812, a detachment under the command of the Italian viceroy Eugene Bograne stayed at the Sentry Tabernacle of the Savvino-Storozhevsky Monastery, located in Zvenigorod. At night, the Prince saw an old man enter his room and quietly requested of the viceroy that his soldiers not plunder the monastery, and in return, the old man promised that Eugene would return home safe and sound. In the morning, the Prince saw this same old man on an icon. The monks told him that this was the founder of the Monastery of Saint Savva. The Prince fulfilled the request of the holy old man – and returned home safe and sound. Today there is a museum located at the monastery. It is open daily from 10 a.m. to 5 p.m., and closed on Mondays. An observation deck and a café are located near the monastery. Also on the monastery grounds, there is a small store where you can buy fresh bread, wine and other monastery products. After visiting the monastery, it is worth your while to go to the hermitage, located nearby. In this part of the monastery – built in 1652 in the cave of St. Savva – they later built baths with spring water. You can bathe here today. The final point of our trip brings us to the village of Dyutkovo, which is located north-west of Zvenigorod on the Sorozhka River. You can get there by car. Earlier, Dyutkovo was an independent village, but in 2003, it became a district of Zvenigorod. The village, founded in the 14th century, was named in honour of the landowner Fyodor Dyutki. In the 19th century, the village gradually became a fashionable holiday settlement, which was often visited by artists Levitan and Savrasov, as well as Chekhov, who worked nearby. Now this is a quiet place, where buildings from Chekhov’s times have been preserved. In Zvenigorod, you will find many different cafes and restaurants. Prices for lunch start at $10. At the Museum of Russian Desserts, a snack with a lecture about the traditions of Russian tea will cost you about $20. In Zvenigorod, all museums charge entrance fees, the average price is about $3. In most museums, you can book a tour, which will cost you about $5. You can also book a tour of the city. The price is negotiable, but no more than $60. The main method of transportation in the city is by taxi. Prices start at $5 and up. In chain stores and in most cafés, you can pay by Visa or MasterCard, but you might run into problems, so it is best to have some cash (roubles) always on hand. Zvenigorod is located on hilly terrain. Therefore, for walking, you should wear light sports clothing and footwear. If you plan on visiting Dyutkovo, you should stock up on sandwiches and drinks. The locals are mostly friendly, but it is worth being cautious, and not visiting any questionable establishments.